CraveInvoice allows you to record transactions in multiple currencies. For each currency you can specify currency symbol, currency name, country and exchange rate. 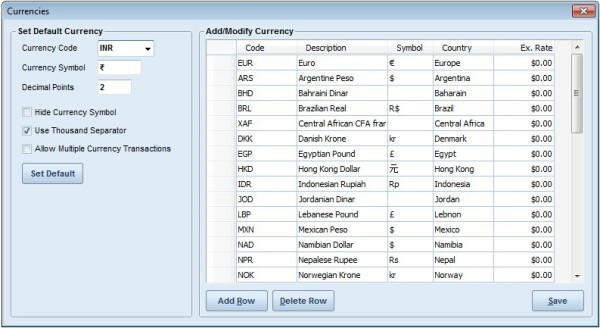 Most of the currencies are defined in the software. If you cannot find the currency for your country then you can add it from Currency master form. When you run the software for the first time, you can setup the currency symbol, date format and decimal points for amount data fields. If you have not setup the currency symbol from first run wizard then you can do it from Currency master. Go to setup menu and click Currencies menu command. If you have enabled multi-currency transaction recording then you will see currency code selection box (drop down) on invoice form and other related forms. The selected currency code is applied to the invoice and when you print the invoice, you will see the invoice amounts with particular currency symbol. You can also specify exchange rate for each invoice for the selected currency to get the net amount of invoice in local currency. INSTALL INDIAN RUPEE SYMBOL: The new Indian currency symbol is recently added into the Unicode character set with code U+20B9. The rupee symbol is supported under Windows Vista and Windows 7. Windows XP does not have support for the rupee symbol as of yet. Please refer the articles below for more information on how to obtain the fonts for the symbol on your computer. Once you install the required updates and fonts on your machine for Indian Rupee symbol, copy it from any application such as Microsoft Word and paste it in the currency symbol column.